What is your idea of a perfect day? Food is a huge part of my life. I am a BIG foodie. And the best thing is when you can have a scrumptious box of pizza oozing with cheesy goodness delivered right at your doorstep. My perfect day would be a lazy Sunday, where I am lazing around with the hubs in front of the TV and scrolling through the movie list. I have been wanting to watch Taken 3 for a while but before we can hit play, the hot food needs to be right in front of us. Who would want to cook on their lazy day, eh? That’s where my favourite app Foodpanda comes in. If you are new to this incredible online food delivery service in Pakistan, then you can read more about it here or here. I’d simply tap on my Android app, put in my location and order pizza from the nearest open pizza joint. No calling, no waiting, no talking! In a few clicks the delivery boy will be right at my door carrying my yummy box of pizza. Mmmm! If home delivered food is part of your perfect day then get your thinking caps on and blog all about it, specifically mentioning how do you use the Foodpanda app (available for iOS, Android and Windows) on your perfect day. 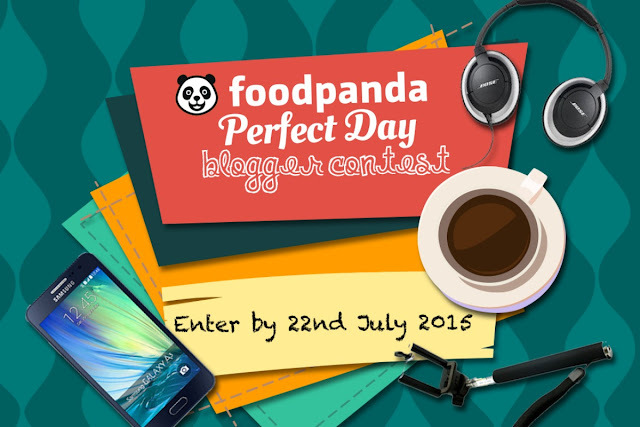 Yes people, Foodpanda is having a grand and exclusive blogger contest (valid for bloggers with proper blogs only) that can enter you in a lucky draw to win one of the three grand prizes. Trust me, when you look at the prizes below you wouldn't want to miss this amazing opportunity. Entries must be received by July 22nd 2015. Winners will be selected by Foodpanda on account of the highest quality posts - photography, writing and imagination will all be taken into account. Winners will be contacted by email and prizes will be distributed shortly after the contest ends. So what are you waiting for bloggers...get, set, GO!